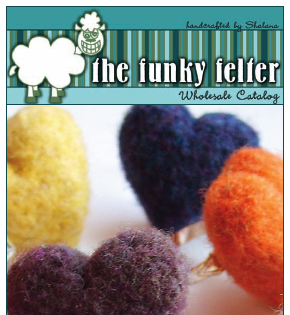 When I first thought about wholesaling my handmade felts, the task of getting organized to do so seemed daunting. As I researched all that was necessary to be prepared for wholesale, there were a lot of varying opinions on how you go about it. I can honestly say that I've been reading article after article and forum post after forum post on the web about how to wholesale for the last six months or more. Every bit of information that I could find I've tried to evaluate how it relates to my small, independent arts and crafts business. Since I do make all of my items by hand, it is a very different situation than a large company that mass produces. The word "wholesale" has to really be defined in terms that are appropriate for the handmade artisan. This is what I've tried to do for myself, after much research and interpretation. I thought that I'd share some important things that I've discovered while setting up my fiber art business for wholesaling. The easiest way for me to convey what I think are the most important basic things to know about wholesaling is just to list them for you. I also think that this is the easiest way for you to receive the information without feeling overwhelmed. I know that I felt very overwhelmed at times while researching articles on the web. I really just want to tell you the basics of what I learned as well as point you to some helpful online information and resources. The following is my recommendation list of where to start when wholesaling your handmade items. Then you'll find some helpful follow-up links that I've come across during my research. 2. True wholesale price is half, or 50%, off your current retail price. I know from many, many forum posts that I've already read on this subject that this statement will make some artists and crafters moan and put you into a state of denial. At first, my reaction was exactly the same because 50% off my original retail prices seemed very steep, and frankly quite ridiculous. I even tried offering 20-40% off my retail prices to interested brick and mortar shops, but the truth is that, in most cases, a shop expects the standard of 50% off when purchasing wholesale. If you look at it from their point of view, they have to be able to mark up your item to cover all their costs as well as make a profit. Also, they do not want you to be underselling them if you sell elsewhere. I admit that there are some shops that will accept a lesser discount, but the true wholesale price standard is at least 50% off your current retail pricing. The good news is that you are making your money buy selling in large quantities so if you've set your retail prices well in the beginning, then you should still make a great profit when wholesaling. 3. Decide your minimums: per item and per order total amount. Through researching this topic, I have found that how you set your minimum numbers is entirely up to you. As an artist or crafter, our items vary so much that the minimum number of items or order total amount for wholesale will be heavily dependent on what your specific items are, whether it be jewelry, potter, fiber art, etc. Of course, you will want to set your item minimums so that you are selling in a large enough quantity to constitute a wholesale price. For instance, on smaller, less costly items, you may require one dozen (12) per item style as a minimum order, but for larger, more costly items, you may only require half that amount as a minimum. Or, perhaps you want to require one set minimum for everything, say 10 or 15 per style. You also may want to set a minimum order total. For instance, maybe it is not worth your while to wholesale unless the minimum order amount is $300 or more. Then you would set your total order minimum to that amount. As you can see, it will all depend on what you choose to set so that you can make a profit from wholesaling and it be worth your time. 4. Put some policies in place to protect you and your buyers. If you have an Etsy shop, you probably already have some policies in place on payment, shipping methods, refunds/returns, etc. You need to do the same when presenting your wholesaling options to a potential buyer. Be clear to the shop owner or representative on how you will handle these important subjects by putting your policies in writing to go with your wholesale options. 6. Make it easy for shops to contact you about wholesale options. Once you are completely organized for wholesaling with minimums and policies set and a linesheet ready, start making your desire to wholesale known wherever you have a presence. My main presence is online so I have made known my willingness to wholesale on all my online venues such as my Etsy shop, my blog, and my fiber arts website. If you have a personal website or blog, I also recommend that you integrate a wholesale request submission form or at least a list of your required information from shops to be emailed to you. This information could include the shop's name, contact name, physical and mailing addresses, phone number, email address, website (if applicable), a little about the shop itself, what their interest is in your items, and their tax i.d. number. 7. Know who you are wholesaling to. Perhaps you are only planning on approaching local area shops to carry your items, but more often than not, you will be approached by shops worldwide, especially if you have an online presence where you actively advertise your wholesale availability. If you do wholesale or consign at local shops, then you will probably meet with the shop owner in-person at some point and browse the shop itself. This is really the best way to get to know who you are selling to and who is representing you, but this is not always possible with a global market. If you do plan to wholesale abroad, I highly recommend that you get to know as much about interested shops as possible. You may not be that picky about who represents your products and how they are presented, and that is entirely up to you. I always like to know a little about shops that inquire for my wholesale options. It is especially nice when they have a website or blog with photos of their store front and a listing of other represented artisans. At the very least, you do need to the basic information that I listed in number six for your records and tax purposes. 8. Start selling! This part can take time (I know from experience! ), but be patient and continue to promote. You may even consider approaching local shops in person about carrying your items, but be respectful of shop owners and try to call ahead for an appointment if possible. You may want to email shops or send out postcard announcements letting them know about your wholesale options. There are many, many ways to attract new wholesale accounts. You really just have to see what works for you and continue to run your business as usual. I hope that the above information is helpful. Although I am certainly no expert on wholesaling my handmade items and have just begun the process, I am happy to share what resources I have found along the way and give you my take on how things work. There are many links below to articles and forums that I found to be interesting and informative when it comes to setting up your arts and crafts business for wholesaling. I hope you can pick and choose to find what helps you the most. Best wishes to any artist or crafter who pursues wholesaling! And feel free to add your personal experiences, insight, and information in the comments. Fashion-Incubator's What is a linesheet? - a detailed description of what to include in a linesheet and how to organize one. Fashion-Incubator's Line sheets revisited - a follow up to their original article above with added information and links. Jewelry Line Sheets by Rena Klingenberg - although geared toward jewelry artisans, this has good linesheet information for any professional artisan. Sales Materials: The Dreaded Line Sheet on StartUpKidsLine.com - shares the experience of creating a linesheet and what is involved. Tips for Pricing Your Handmade Crafts - suggestions on how to price your items for both wholesale and retail based on labor, materials cost, etc. How to Price Your Handmade Goods - an in-depth article on the business of art for the independent artist or crafter which contains a lot of good information presented with many aspects in mind. Home Jewelry Success Tips by Rena Klingenberg - although geared toward jewelry artists, this site's information can apply to other artisans as well. The Switchboards Forum - great info on wholesale, promotions, press releases, and much, much more! Craftster.org's Forum section Opportunities for Crafters - some information on possible promotion opportunities involving web, print, and film as well as some listings for shops seeking handmade items. Etsy's Forum - if you search for "wholesale" on Etsy's forum, you will come across many Etsy sellers' posts regarding their experiences with wholesale which can be very, very helpful. The EtsyWiki - this Etsy resource has an entire section devoted to wholesale. **the photo image is a portion of the front cover of my wholesale linesheet brochure. If you'd like to request a full linesheet of my wholesale items, please visit my wholesale request page. Great info Shalana - I have been working on a portfolio/line sheet as you suggest - it is something that people ask for and also looks more professional when you are approaching shops as a business. Congrats on your success! What a fantastic post! Thank you for sharing all that research. I've just blooged about your blog to spread the word! that's fantastic. thanks for compiling it so nicely!! AND, I love your felts. They're great! Incredibly useful! Thank you so much for sharing. Well written. Tks for your helpful info on wholesale. :) I can't agree with you more on the 50% wholesale price. I bought some whole sale charms from an online store and was given about 50% of the retail price. When I calculated how much money I could make if I resell at smaller quanity as supplies, I found the profit to be just a few cents or nothing at all after deducting shipping n listing fees. So for all the effort, time etc, it is not worth it. That is a good % at which wholesalers guarantee that you will not resell their stuffs at a price even lower than their retail price so that you become their competitor. Thus, when I finally decide to buy from them after all, I bought them as a crafter using the charm for my felt crafts n jewellery. In fact, in my months of research previously at several online wholesale sites n also etsy, I found many sellers selling using multiple accounts at the same sites (including a couple of suppliers at etsy) at diff prices. All great advice, and pretty much how I've been doing it. Check out my blog for the latest pictures of what just shipped out wholesale. It's working oout great for me, in both of my shops. Great information and well-organized. Thanks! Wow, I'm pleasantly surprised at all the response on this :) Thanks for all your kind comments! And, Tasha or anyone else interested, you are welcome to link back to my post in some way on your blogs with a little intro/synopsis/etc. of your own, but I'd prefer that my article wasn't copy/pasted verbatim. what a great article this must have taken a long time just wanted to show some love for the hardwork you put into this! What a fantastic post! Thank you so much for posting all of this information in one place. informative post, I have bookmarked it for later as there should be some useful links there thanks! i have a lot to think about now. This is a FANTASTIC post! Thanks for all your research and for the simple and easy to understand info! thank you for the informative and generous (!) post, shalana... after reading all this, my head is spinning, in a good way (not like linda blair in the exorcist). Thank you very much for your generous post. It's very usefull. I just start to sell my felts. I'm at home with my 2 years old son and working on my felt business. Wow, this is fantastic information! I would love to link to this in my next Crafty Business Roundup if you didn't mind. What a helpful article! Thank you so much for writing this!